We’d love your help. Let us know what’s wrong with this preview of Oak & Mistletoe by J.Z.N. McCauley. A modern fairy tale adventure styled fantasy set in Ireland with magic, clean romance, and true love. -Award-winning book of 2017 New Apple Summer E-book Awards in Cross Genre category. -Finalist in Ireland’s 2016 Drunken Druid Awards. To ask other readers questions about Oak & Mistletoe, please sign up. This story had so, so many elements I absolutely adore. It's set in Ireland and has all of this magical/mystical stuff like fairies, druids, and curses woven into an absolutely gorgeous setting. I thought this would be more YA, but it was a refreshing change to see a similar style story with adults in their mid-twenties! The prologue starts with Catherine visiting her uncle in Ireland with her brother and twin sister. The uncle tells her he thinks she has a tinge of magic in her or is connected This story had so, so many elements I absolutely adore. It's set in Ireland and has all of this magical/mystical stuff like fairies, druids, and curses woven into an absolutely gorgeous setting. I thought this would be more YA, but it was a refreshing change to see a similar style story with adults in their mid-twenties! The prologue starts with Catherine visiting her uncle in Ireland with her brother and twin sister. The uncle tells her he thinks she has a tinge of magic in her or is connected more to Ireland. He's murdered shortly after. Then the story picks up two years later when Catherine's living in Ireland and working at a museum. Her twin sister Kathleen is getting a divorce and is still a bit materialistic and annoying. While she's wearing Catherine's jacket and glasses, some random guy grabs her and tells her that she has to "just get out of here, out of Ireland... because if you don't, you'll unleash them." And then he's gone. His name's Bowen and he proceeds to keep showing up and angrily telling Catherine to get out of Ireland, but not filling her in. Catherine is attracted to him. There's a moment of really lovely character development for Kathleen, but then she's (view spoiler)[murdered (hide spoiler)] by some psycho guy who was trapped in a rock. It turns out Bowen is a druid over 2,000 years old and has been living in an ageless state until the woman he will truly love appears to unintentionally break the curse a high priest's daughter put on that psycho twin-killing guy and his followers (which is how those guys got trapped in the rocks). So now they're free and out to get Bowen and Catherine. Bowen & Catherine go off on a quest to find the remnants of Bowen's people, which are cool items like the staff of a priest... and they're obviously hidden in gorgeous, hard-to-reach locations. A lot of action and answers unfold. Catherine's brother is kind of in the story sometimes, but then he disappears. I loved the premise of the story and think the author has a super original and creative idea here. I would have liked to have seen more in each area though... it's a pretty fast/short read and kind of felt like it just breezed through the surface while covering a TON instead of letting the reader really connect with everything. Like I wasn't entirely sold on the attraction between Bowen and Catherine, even though I really liked the idea of it. And it did take me a while to get into the story with all of the cryptic warnings and no answers. But I still liked the book and recommend it if you love Ireland! The author definitely knows her stuff about Irish history, myths, geography, culture, etc. I'm not sure if she lived there, but this felt like one of the most authentic or better-researched stories about Ireland I've read. A story about a young girl who is the reason a spell meant to keep evil caged is broken. Being the only one who can cast it again Catherine embarks on a journey filled with Druids, wee-folk and Bowen the man who is there to help her with a few secrets of his own. As much as I wanted to love this book I just couldn’t. The biggest problem was that the POV’s switched every two to three lines sometimes pages with no warning. I couldn’t figure out when Catherine, Bowen or Danny POV was. I also couldn’t relate to the characters. Rather than feeling what they were and experiencing it with them, I was told, making it impossible to completely immerse myself into the book. The relationship between Catherine and Bowen made no sense, I couldn’t ‘feel’ the connection. The plot itself had some very good elements and was planned well, but the way it was written didn’t take the story to its fullest potential. I received an eBook ARC of Oak & Mistletoe to read! It took a little while before I was hooked into the story, until the adventure began, and we learned more about the characters's backgrounds. I really enjoyed how everything came together at the end. J.Z.N did a beautiful job tying the story off. Looking forward to what's installed for Catherine and Bowen in book two! Oak and Mistletoe is a fresh new adult fantasy story that features ancient druids, curses, love, loss, and a quest for revenge. The story follows Catherine Greene, a young woman who moves to Ireland after landing her dream job. There, she meets the mysterious Bowen, who orders her to leave Ireland before she causes disaster to befall the island. Catherine accidentally unleashes an evil army of ancient druids by breaking a curse cast thousands of I received an ARC in exchange for an honest review. Oak and Mistletoe is a fresh new adult fantasy story that features ancient druids, curses, love, loss, and a quest for revenge. The story follows Catherine Greene, a young woman who moves to Ireland after landing her dream job. There, she meets the mysterious Bowen, who orders her to leave Ireland before she causes disaster to befall the island. Catherine accidentally unleashes an evil army of ancient druids by breaking a curse cast thousands of years ago. Shortly after that, Catherine learns the consequences of breaking the curse in the most brutal way and sets out on the quest for revenge. JZN McCauley created some amazing characters in this story. A lot of her secondary characters are just as interesting and relatable as Catherine and Bowen. The antagonist, Conall, is really well thought out and reminds us that good vs. evil isn't always black and white. There is plenty of characters that walk in the shades of grey, which makes them (and the world in Oak and Mistletoe) more believable. The relationships between characters are also really well developed-- nothing feeling forced. The story did start out a bit jumpy, with short scenes that drove the plot forward in a choppy way. However, as soon as the curse is broken, the pacing gets better. The scenes don't feel too short anymore and the pacing is fantastic. There is tons of action mixed with the characters' downtime. As this is the first book in a planned trilogy, I was worried that the book would end on a massive cliffhanger, but everything wrapped up beautifully. While there are still some loose ends/questions the reader is left with, I was left completely satisfied by the ending. I had to force myself to get here to be honest. The sentences were choppy. They gave us information like this. So that we could see everything in small sentences. Rather than in one that would explain everything and flow nicely. As well, the situation just didn't make sense to me. Why did the uncle randomly tell Catherine about magic? There was no prior mention of it and then he was just killed off with no r Disclaimer: I received a free copy of this book in exchange for an honest review. Catherine Green, her twin sister, and her brother have the opportunity to travel to Ireland as a college graduation present. Catherine's visit becomes permanent when she lands a job at a museum. She finds herself oddly attracted to Bowen, a stranger who's a sort of expert on local history who warns her to leave the country before it's too late. Catherine quickly begins to realize that she's actually the key to a centuries old curse as she I received a free ecopy in exchange for an honest review. Catherine Green, her twin sister, and her brother have the opportunity to travel to Ireland as a college graduation present. Catherine's visit becomes permanent when she lands a job at a museum. She finds herself oddly attracted to Bowen, a stranger who's a sort of expert on local history who warns her to leave the country before it's too late. Catherine quickly begins to realize that she's actually the key to a centuries old curse as she frees a psychotic druid and his followers. Tragedy ensues and Catherine is forced to work with Bowen and together the two get swept up on an adventure involving Celtic myth and long-forgotten knowledge. The two going to have to work together to make sure sure Conall doesn't put his evil plans in motion, and they'll have to do whatever it takes. Oak and Mistletoe is the first book in The Rituals Trilogy by J.Z.N. McCauley, and is a New Adult fantasy with a clean romance. The overall concept behind the story is pretty cool and I love that it features druids and Irish mythology. Since I was reading a novel of The Iron Druid Chronicles while reading this story, I have to admit that I would have been very pleased indeed if Atticus O'Sullivan could have had a cameo. Between Catherine and her twin Kathleen, I was definitely more interested in Catherine, but I have to admit Kathleen does get a moment of really great character development before she meets her untimely fate. In regards to the magic, I liked what we got to see of it and I would have preferred to learn more about how it all works - I'm just not all that sold on what makes Catherine the key (it's all to do with Bowen). On that note, I couldn't really get behind their romance since he withholds a good deal of vital information from her (view spoiler)[that could have saved her twin (hide spoiler)] in order to "keep her safe". I really enjoyed this book and I loved Bowen so very much! Okay, so this review is a little bit belated (three days). My deepest apologies; I was sick all of last week and did absolutely nothing, so I had no time to write the review. It's here now though, so let's proceed! Oak and Mistletoe is a book which perfectly filled my 'light reading' preferences. Whenever I'm sick or not in the mood to read (or I am really tired and don't want to hold the book up), there are a couple of things I look for in a book: fae or elves, a good romance, the possibility to read it on my Kindle and a fast paced plot. This book ticked all of those books. It was a NA novel which I am getting into more and more recently, so the main character was a little bit older. As such, I found it fascinating to see the family dynamics in this book, which is something I enjoy in general. What left the biggest impression on me, however, was the romance. It has been a couple of months since I read this book (I think I read it at the end of October) and I have fogortten some of the finer points of the plot- it has gotten mixed up with other books that I have read and I couldn't give you a good summary beyond the basic principle. This isn't a bad thing; I would remember everything as soon as I started reading the book. However, when I think of this book, amongst a couple of spoilery things, I think of the romance between the two main characters. I really loved the romance; I found the dynamics interesting and thought they worked really well as a couple but also as friends, which is something that can be overlooked when it comes to romance in novels. Sure they have to have romance and their should be sexual tension blah blah blah, but if they wouldn't be friends then the relationship is far less believable, natural or interesting. I also really liked the love interest as a character, which always helps. I was so excited when I received this book in the mail. The cover is beautiful and I was intrigued by the theme of this book: Ancient druids, curses, love, loss. I think the author created great characters but they definitely have the potential to be better. I would have liked some more character development, especially with Catherine and Bowen. At first it was hard to get into the book because I felt the beginning went a bit slow I received and ARC of this book in exchange for an honest review. I think the author created great characters but they definitely have the potential to be better. I would have liked some more character development, especially with Catherine and Bowen. At first it was hard to get into the book because I felt the beginning went a bit slow and the transitions were choppy. After a certain character death happens and the curse is broken though, the pace picks up. Some things that bothered me a bit were some parts of dialogue and how quickly the characters just accepted everything that was happening. For me, it was hard to imagine some of the dialogue actually being spoken out loud. Some parts seemed forced and uncomfortable. Some major events happen in the book and the characters seem to not take very long to accept what has happened which also seemed unnatural. Because of the few things that bothered me I am giving this book 4 stars. I genuinely enjoyed the story though. Upon hearing there would be a second book I was worried it would end in a cliff hanger, but it doesn't. I think the author neatly ties things up. The reader is still left with some questions but I don't doubt those will be answered in the next book. This book- as much as I read of it- was boring, unengaging and juvenile. Things happen for no apparent reason other than to set up the next encounter, so mostly they occur in a vacuum. And it's all exposition- nothing actually happens to the characters, we're always told what's going on. In short sentences. Like this. That don't really explain much. So you get lots of them. The three main characters moved to Ireland, their grandfather died, another got a job at a museum, and another actually got married and divorced in between chapters, all only to be mentioned during casual conversation and a couple sentences. I so enjoyed this!! The dialogue was so realistic, and the adventure was exciting. Though it tied everything up at the end, it left me wondering about a couple things. Maybe they will be mentioned in the sequel. I hope so because I'm really curious. Reading this book was a bit of a maddening experience because you can tell the author had great ideas but the execution is not great. Everything is told instead of shown, there's insta-love and many convinient things happen. There were some moments were the writing was good and I liked that the characters were adults but overall the story was ok. I have to admit it took me a little while to get into this book but once things started coming together I really enjoyed it. I loved that magical history that was woven into this story. The romance was sweet and the plot twists kept me captivated. The imagination that came into play by the author in creating this original tale was fantastic. It was a great read! This book was sent to me by J.Z.N. McCauley in exchange for an honest review. The premise of this story was new and exciting, and I was very intrigued to see how it was all going to play out. Druids, magical powers, dark and handsome men, mystery..all of these things drew me in! I love that it wasn't your typical fantasy book and took the story in a different direction that I was expecting. There's a certain character death in this book that I wasn't ready for, and it shocked me so much! I love t This book was sent to me by J.Z.N. McCauley in exchange for an honest review. The premise of this story was new and exciting, and I was very intrigued to see how it was all going to play out. Druids, magical powers, dark and handsome men, mystery..all of these things drew me in! I love that it wasn't your typical fantasy book and took the story in a different direction that I was expecting. There's a certain character death in this book that I wasn't ready for, and it shocked me so much! I love that in a book. I'm not always excited about character deaths, that sounded bad, but when I'm left so surprised by a twist it's an exhilarating feeling that makes me want to read more. I really enjoyed Catherine as a main character. She wasn't overly confident, but she also wasn't timid or self conscious. She took care of herself and her family, while dealing with all the other struggles in her life, and I think she handled them very well. I do wish there was a little more character development with her, but perhaps we'll get that in the second book. I did have some problems with this book, and the lack of detail was the biggest one. They're in Dublin and I really craved more description of the area, of how beautiful it is. They visited a few tourist attractions but it's brushed over very quickly with hardly any mention. It left me feeling like it was all very abrupt. It also bothered me how quickly Catherine and Danny accepted everything that was happening. As much as I didn't want there to be many chapters of "I don't believe it, this can't be happening" bla bla bla, I think it could have used more build up and a little more work to get everything to meld together. I'm drawn to Bowen, but I also want more character development on him as well! All the things he's seen and been through...we need to see more of that. Maybe through flashbacks, or even novellas. A Bowen Novella would be an amazing way to tie some of this together. It's a little weird how quickly Catherine just accepts that he's around, even though she's confused as to why. But I think it was so that the story could move along at a faster pace. Things moved so quickly that I was often left a little dazed trying to keep up. I love the new spin on fantasy, and I love where it was headed, I just think it could use a little more meat on its bones. The whole time I was reading this book I couldn't help but feel that I've read it or met the characters before. While familiar in some cases, the story with "Oak & Mistletoe" is not redundant and I really enjoyed following Catherine and Bowen on their journey. Catherine is an immediately likable character and perhaps the most mature in her family of three siblings. I really liked observing the interaction between Catherine and family and almost wish there was more of it in the story. In addi The whole time I was reading this book I couldn't help but feel that I've read it or met the characters before. While familiar in some cases, the story with "Oak & Mistletoe" is not redundant and I really enjoyed following Catherine and Bowen on their journey. Catherine is an immediately likable character and perhaps the most mature in her family of three siblings. I really liked observing the interaction between Catherine and family and almost wish there was more of it in the story. In addition, it's nice to see a slow-developing relationship between Catherine and Bowen rather than an insta-love situation. As the reader progresses through the book, it's clear the two have quite a connection even though they hail from different time periods. I have to admit that I had one main pet peeve with the book. Catherine's twin's name is Kathleen and I found it too similar. In fact, in the beginning, I had to make sure I knew who I was reading about. It's a small peeve, but it exists nonetheless. The only down side for me was I wish there was more description of the areas that they were in because Ireland is such a beautiful country but this downside wasn't enough for me to knock a star off. It was a very good read, I highly suggest it for anyone who wants to read about druids and magic. It definitely has a young adult, fantasy, feel also, there's a little romance. I cannot wait for the next book!! I was so excited to read this book when I first heard about it and I literally freaked out when I got the package in the mail. The cover is stunning and the book summary had me hooked. The overall feel of the book is amazing and I love the characters and their story. Oak & Mistletoe is about Catherine Green, a girl who travels to Ireland with her siblings and ends up landing her dream job. She ends up accidenta Disclaimer: I was sent this book by the author in exchange for an honest review. Oak & Mistletoe is about Catherine Green, a girl who travels to Ireland with her siblings and ends up landing her dream job. She ends up accidentally breaking a hidden curse and releasing a ancient evil madman named Conall and his army of druid followers. His release leads to destruction and a character death. Catherine spends the rest of the story avenging the lost character & makes it her goal to get revenge on Conall. I loved the story but I wish there was more detail. Ireland is an amazing place & I wish I got a better feel of the surroundings. I also wish that the story wasn't as jumpy. In some parts it's kind of confusing to understand what's going on. Lastly, the author should have shown a bit more character development with Bowen and Catherine. DISCLAIMER: I was given an ARC of this book. Second attempt to share this review. This book is amazing. Not only is the story original, but the writing is so good and the characters memorable. This book follows Catherine, a woman who originally planned on only visiting Ireland with her brother and sister. Evidently, Catherine falls in love with the country and takes up permanent residence. Catherine now runs into a certain man who keeps warning her to leave Ireland. At first, she just thinks he is DISCLAIMER: I was given an ARC of this book. This book is amazing. Not only is the story original, but the writing is so good and the characters memorable. This book follows Catherine, a woman who originally planned on only visiting Ireland with her brother and sister. Evidently, Catherine falls in love with the country and takes up permanent residence. Catherine now runs into a certain man who keeps warning her to leave Ireland. At first, she just thinks he is . . . some crazy dude just trying to freak her out. Things are not always what they appear. Oak an Mistletoe by J.Z.N. McCauley is volume one in her Rituals Trilogy. In this book we are introduced to Catherine, her twin sister Kathleen and her older brother, Danny. Things are great in their lives. They are arriving in Ireland for a little vacation and for Catherine to apply for an internship. While they are there they meet up with a family member one day only to learn the very next day that he has been murdered. She not only lands the internship but is told that they want her to stay o Oak an Mistletoe by J.Z.N. McCauley is volume one in her Rituals Trilogy. In this book we are introduced to Catherine, her twin sister Kathleen and her older brother, Danny. Things are great in their lives. They are arriving in Ireland for a little vacation and for Catherine to apply for an internship. While they are there they meet up with a family member one day only to learn the very next day that he has been murdered. She not only lands the internship but is told that they want her to stay on permanently when it ends. She's elated and Ireland becomes her new home. While in Ireland Catherine's life goes on as normal. But she has become the one her siblings turn to. Her sister has returned in the wake of getting a divorce and soon her brother comes as well when he quits his job. Kathleen is mistaken for Catherine and told by a man that she must leave for her sake and the sake of her loved ones. Catherine of course refuses. When she demands an explanation, after confronting the man, he refuses to tell her. Catherine is in serious danger but she has no idea how closely it looms or where it is coming from. With her presence in Ireland, and Bowen's growing attraction to her an ancient curse is being broken and an old evil set free. There will be heartbreaking loss but Catherine must push forward if she is going to save those she cares for. Oak and Mistletoe is a clean romance with some fantasy and magical elements to it. This is an enjoyable book. It has good dynamics between the characters overall. I really like the dynamics between the siblings. More often than not siblings are written as not really having a close relationship with each other but you can tell that they really care for each other. Catherine is obviously the more solid of the sibling. The story is well written overall and has some good moments to it. Catherine is a strong character but she is very contrary. She has suffered quite a bit of loss and knows that her life is in danger. She knows that Conall is after her life to make Browen hurt. But yet and still when he pointedly asks her not to leave a coffee shop they are at she does exactly that and gets into trouble. With the aid of his followers, Conall dogs their steps as he seeks to kill Browen but not before making him suffer for the pain that he himself feels from a loss years gone by. There is romance in this story but in some ways it feels rushed and others it feels lukewarm at best. Browen believes that she is the woman he loves but he barely even knows her when that assumption is made. While the storyline flows smoothly it is not as engaging as I would hope. I like it when the title of a story is tied into the story itself because it helps it all come together and make sense. It takes over halfway through the book before that happens. For me, I would have liked it more if that had been more the focus of the novel itself as a whole. I think that it would make the story more engaging and more interesting. This is a very clean and soft romance novel. This story is an adventure novel with danger at every turn but things don't really pick up until almost halfway through when things start getting more intense in areas. Catherine is brave yet she has her fragile moments. There are some things that occur that don't really make sense but I just went with it, like the brother bailing the acolyte out of jail. I appreciate the story that explains a few things but I would have liked some flashbacks from Bowen and Conall. I think it would have really added a more engaging element to the story. I thoroughly enjoyed this book and learned so much about Ireland in the process. I have always wanted to visit Ireland but this book has made me want to visit all the places in Ireland it mentions. From the way the author writes, I would think they lived in Ireland for years. I highly recommend this book to people who love romance, fantasy, or Ireland. Oak and Mistletoe started off a little slow but gained momentum and kept me hooked. Catherine is a relatable character who visits Ireland with he I thoroughly enjoyed this book and learned so much about Ireland in the process. I have always wanted to visit Ireland but this book has made me want to visit all the places in Ireland it mentions. From the way the author writes, I would think they lived in Ireland for years. I highly recommend this book to people who love romance, fantasy, or Ireland. I was given a copy of the ebook in exchange of an honest review. We follow the story of Catherine, as her life dramatically changes once she gets involved with magic, curses and ancient druids. Once she accidentally breaks an ancient curse keeping a big baddy trapped, she has to partner up with her brother and a mysterious fellow in order to make everything right again. Something interesting about this story is that even though the book is considered a YA novel the main character is actually in her I was given a copy of the ebook in exchange of an honest review. Something interesting about this story is that even though the book is considered a YA novel the main character is actually in her mid-twenties which is quite refreshing (Would this be a new adult?). Catherine lives in Ireland and works at a museum. Through out the story we watch her actually think of the consequences of actions which isn’t alway seen in YA. 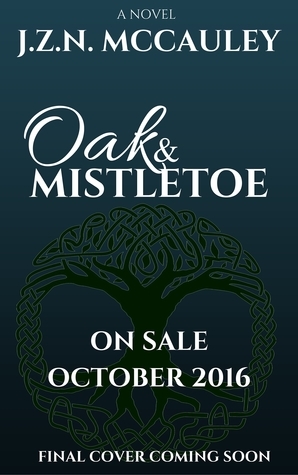 Oak & Misletoe is a new adult novel about Druids, Celtic myth, and coming of age. J.Z.N. McCauley did an excellent job of intertwining current events with fantasy and the past, and I was intrigued by how she was able to create a contemporary cast of characters, but was also able to make fantasy become believable and alive. McCauley's novel is a perfect book for anyone looking into Celtic mythology simply because it connects mythology to modern life, and it makes it understandable. I also alwa Oak & Misletoe is a new adult novel about Druids, Celtic myth, and coming of age. J.Z.N. McCauley did an excellent job of intertwining current events with fantasy and the past, and I was intrigued by how she was able to create a contemporary cast of characters, but was also able to make fantasy become believable and alive. McCauley's novel is a perfect book for anyone looking into Celtic mythology simply because it connects mythology to modern life, and it makes it understandable. I also always look for strong, female protagonists in fantasy/adventure novels, and I couldn't have asked for a better heroine than Cathleen Green. She is one of the best characters that I have read who develops so much in such a short novel. Cathleen begins as a shy, naive woman but ends up being a powerhouse who takes on evil forces and tries to make everything right. She is super woman, and she is an excellent role model for readers in this age group. McCauley didn't dwell on physical aspects of the characters, and I think that this helped me as a reader to connect to the characters in the way that I saw them. I particularly liked the beautiful descriptions in this novel of Ireland and the mythology that is part of the country. I could see the landscape for myself, and reading the pages was like me traveling to Ireland myself. McCauley was able to portray to the reader a beautiful setting with an intriguing plot to fill it, and I felt myself falling into McCauley's beautiful words as I read on. Even though I was not fond of the romance in this novel due to the fact that it came off as cliche, I did like learning about the different legends of Ireland itself. It is a great novel to help you escape to another place and time, and I would highly recommend it as a beautiful, fall read. Danny, Kathleen, and Catherine Green Go to Dublin, Ireland to celebrate college graduation. They stay at a hostel and visit the sights, including a visit to Uncle Mickey and his dog Brighton in the town of Baltinglass. Uncle Mickey and Caty, a nickname Catherine hates, have much in common with her affinity for Irish ruins and folklore and is one with the isle. Her uncle told her she was very special, which she highly doubted since Kathleen is her twin sister. As they have traveled along visiting Danny, Kathleen, and Catherine Green Go to Dublin, Ireland to celebrate college graduation. They stay at a hostel and visit the sights, including a visit to Uncle Mickey and his dog Brighton in the town of Baltinglass. Uncle Mickey and Caty, a nickname Catherine hates, have much in common with her affinity for Irish ruins and folklore and is one with the isle. Her uncle told her she was very special, which she highly doubted since Kathleen is her twin sister. As they have traveled along visiting the sites, Catherine keeps seeing a man with curly brown hair everywhere they go,but he disappears as soon as she looks for him. The day after visiting Uncle Mickey, the Garda (police) come to the hostel to inform them that their uncle was murdered. Danny and Kathleen return to the states, while Catherine starts first her internship, then a permanent position with the museum. The curly haired man keeps telling her to leave. Catherine's siblings return to live with her, Kathleen, after a very short marriage, then Danny, looking for a new career. Kathleen has let her hair go back to her natural red, after having it black when they were on vacation. The curly haired man mistakenly grabs Kathleen and tells her to leave the country and Catherine pulls him away. He did not know they were twins. He finally introduces himself as Dolan an tells Catherine she must leave because there is a curse that was foretold she would break, and would release evil onto the country. She ignores him as a kook and spends time wandering the fields and forests near her home with Kathleen. Catherine has a small accident while hiking and loses her treasured pearl earring. Kathleen goes looking for the earring where they were hiking and Catherine goes running after her. Unknown to her she has broken the curse and evil Druids have escaped their entrapment and Kill Kathleen in front of her. Dolan arrives at the murder scene and burns Kathleen's body. When Catherine and Danny are out, their house is burnt to the ground, and they take off with Dolan, letting the Garda believe they all died in the fire. This story had potential and some idea, but it was killed by the execution of it. I couldnt place events in time line like something was leaking. I absolutely loved reading Oak & Mistletoe! Since I love Ireland and mythology ever since, I knew I had to read this book, and it was totally worth it! The story of Oak & Mistletoe is mostly about Catherine Green, a girl which comes to Ireland with her twin sister Kathleen and her brother Danny to visit their relatives at first, but when she gets an amazing job at a museum, she decides to stay longer. Everything seems well until the good-looking Bowen appears in Catherine's life and takes her whole world upside down. Things happen she deeply hopes wouldn't have and never imagined possible. And if that wasn't already enough, when learning she's connected to the ancient druids of Ireland and is the only one to break an old curse, it's her time to prove herself. With passion and determination, Catherine starts taking on a journey, which doesn't only change the people and the world around her but herself a lot too. She discovers great and astounding truths but also shocking secrets that should have better kept hidden. J.Z.N. Mccauley did a great job in keeping the balance between old and new and managed to put changes just there, where you didn't expect them. I couldn't finish this, I quit at 30%. It was all so contrived. It's perfectly normal for all three siblings to move to another country together, as adults, not as children with their parents. A person who studied history in college and works in a museum in Ireland knows almost nothing about Druids. The main character falls for her creepy stalker who won't tell her anything about what is going on and attacks her twin sister. She falls for him before they even have I couldn't finish this, I quit at 30%. It was all so contrived. The main character falls for her creepy stalker who won't tell her anything about what is going on and attacks her twin sister. She falls for him before they even have a proper conversation, but after the attack on her sister. I stopped reading when her brother bailed the enemy out of jail. I hate writing bad reviews and I normally wouldn't post this, but I agreed to read and review it so there you go. I received this the arc of this book from the author. No review requirements stipulated. Goodreads giveaway. Thank you so much for sending it my way. I was thrilled to get this in the mail today. The blurb on the back was intriguing and I dove into it. The premise of the book is interesting. The prologue opens with twin sisters and an older brother taking a trip to Ireland after the twin sisters graduate from college. They stay in a hostel one night, then visit a long lost uncle the next day, th I received this the arc of this book from the author. No review requirements stipulated. Goodreads giveaway. Thank you so much for sending it my way. The premise of the book is interesting. The prologue opens with twin sisters and an older brother taking a trip to Ireland after the twin sisters graduate from college. They stay in a hostel one night, then visit a long lost uncle the next day, then the third day they are back in Dublin and find out the uncle has died - but not of natural causes. I wish the story was resolving this plot-line, being a sibling mystery squad attempting to discover what happened and inadvertently crossing paths with the druids that have been in hiding having a grand adventure before settling down into a career. But that's not the way it goes, once you turn the page to start the first official chapter, nothing more is mentioned of the Uncle who died. By fast-forwarding two years since the prologue the time gaps are swiftly filled in without further reference to a marriage/divorce, escaping 2 years of corporate america and landing a dream job abroad. All the details shared to bridge the gap between the Uncle Dying to the present are superficial, referenced briefly and no depth to these young adult/new adult coming to a cross-road situations. Based on the prologue, you have an elementary understanding of the characters (the sisters have names that are really similar and this annoyed me. ).You also have a hint at some magic in Ireland and the one sister has a innate connection to the land as if it is her talisman. (Why doesn't her identical twin have this connection, how does this connection manifest?) I wish there was a second prologue to get the back story of the druid story line and characters, history, magic and omens so that it was more balanced. Without spoiling anything, around page 50 things got twisty. With the seriousness of the themes presented, there should have been a balance with some levity and humor. Again, balance was needed. I was sort of into it at the beginning. I realize this is an ARC and may have had a strong editorial hand hard at work after this edition and before the final print/publishing but I was distracted to the point where it was frustrating to read. The premise is good, the execution felt rushed. Nanowrimo? If you liked this book because of Druid wars, Kevin Hearne's Iron Druid series would be up your alley. This one is also an adult series. I made it 85 pages in before adding this one to my did not finish pile. I normally quit at 75 pages but wanted to give this one the benefit of the doubt. I gave this 2 stars as it didn't work for me. I received a copy as a voluntary reviewer. Catherines story was a very pleasant read. She came to visit her uncle in Ireland together with her twin Kathleen and brother Danny, when a stranger warned her to leave immediately and prevent a disaster. She refused and decided to stay and live in Ireland, and strange things started to happen. Murder of her uncle, breaking a millenia old curse, watching her twin killed and ancient druids regain their power. The druid leader, Conall, is a pitiful yet evi I received a copy as a voluntary reviewer. Catherine´s story was a very pleasant read. She came to visit her uncle in Ireland together with her twin Kathleen and brother Danny, when a stranger warned her to leave immediately and prevent a disaster. She refused and decided to stay and live in Ireland, and strange things started to happen. Murder of her uncle, breaking a millenia old curse, watching her twin killed and ancient druids regain their power. The druid leader, Conall, is a pitiful yet evil creature with enormous magical power and ability to shift, driven by mad grief and lust for revenge. Deep pain twisted his mind and he became a cruel leader seeking rulership over the world. In order to stop him, Catherine and Bowen went on a dangerous journey to uncover Caty´s magical powers and save her brother. Fairytale-like world with atmosphere humming with magic and Catherine´s incredible power to destroy and heal are two base stones I built my pleasant experience on. Both main protagonists are interesting, full of understanding that makes them accept their nature and assimilate to changes, which develops their personalities greatly. I also found Kathleen´s character very amusing, a typical careless girl from big city and shallow desires, only to be proven wrong when she opens up to her twin sister. Although I appreciate the peaceful mood of the whole story, it made the fighting scenes a bit odd. I did not feel any tension on suspense, simply knowing it would end well. I also felt the pace slowing down in several passages, and I would certainly welcome more dialogues - and a bit more romance between Bowen and Catherine, since the main plot many times dominated the development of their relationship. J.Z.N. McCauley currently resides in Connecticut, where she loves wearing jackets and boots in the unpredictable weather there. She is a mother who enjoys life to the fullest. Also, being a nerd across many genres is something she expresses openly. Funny quirk number one: When the chance pops up to travel to any of her favorite places, she takes way too many pictures. Number two: She hates her handwriting and often can’t read her own handwritten notes. She writes a mix of sci-fi/fantasy, historical fiction, and contemporary (sometimes all in one story) in New Adult and Young Adult categories. Currently, she is working on multiple projects. Please follow her here for updates and future works, or check out her website linked above.